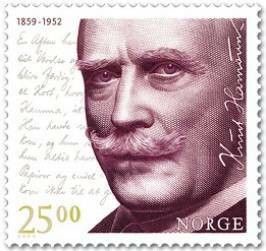 Controversy has erupted after Norway issued a stamp honouring a writer who sympathised with the Nazis. Knut Hamsun won the Nobel Prize for Literature in 1920, but met Hitler during the German occupation of Norway in 1943 and later wrote an positive obituary for him. He also encouraged Germany to ‘bring England to its knees’ in a wartime newspaper article. After the war, he was put on trial, but he was declared mentally incompetent and was fined rather than imprisoned. Baruch Tenembaum, who runs the International Raoul Wallenberg Foundation, named after the Swedish diplomat who rescued Jews from the Holocaust, objected to the stamp, saying: ‘Celebrating the life of a Nazi, regardless of his literary merits, is despicable. Doing so through a stamp is even more obscene.